On Sunday November 27th, fans of Canadian Football will have all their attention fixed on the newly renovated BC Place Stadium for the 99th Annual Grey Cup. For those unfamiliar with Canadian Football or even the Canadian Football League (CFL), the Grey Cup is to Canadian Football what the Super Bowl is to American Football. This year, the rivalry between East and West over the Cup will be the BC Lions against the Winnipeg Blue Bombers. For those non-Canadians unfamiliar with the CFL, the CFL is as much a part of Canadiana as the NFL is to Americana. The Grey Cup has been part of league football in Canada since 1909 but it wasn’t until the CFL formed in1958 that the Grey Cup was a permanent fixture in Canadiana. For the most part, the CFL consists of nine teams except when something goes wrong with one of them. Usually there is at least one city that has problems with their CFL team. In the 80’s and 90’s, it was Montreal. Now it’s Ottawa. But don’t worry. Ottawa will be returning in 2013. Plus there’s talk of possible franchises in the future from Quebec City or Halifax. For the most part, the CFL has been happy to be Canada’s own football league. For many decades, it didn’t worry about competing with the NFL because it knew it had a very solid dedicated base in Canada. Things became uncomfortable in the late 80’s when the CFL tried attracting new players to the league but couldn’t compete with the big salaries of the NFL teams. In the 90’s, the CFL tried things like offer a $5 million annual salary to Raghib ‘Rocket’ Ismael to join the Toronto Argonauts in 1991. It turned out to a success for that one year. Sure the Rocket and the Argos won the Grey Cup that year but the Rocket’s career went downhill after that. The success of the Rocket led to the CFL to form franchises in cities like Sacramento, Baltimore, Las Vegas and Shreveport. In 1995 Birmingham and Memphis entered the league. The 1995 Grey Cup came as a shocker as the Baltimore Stallions won; the only time an American team won the Grey Cup. After a lot of business issues and bad management from some American teams, the CFL returned to being based completely in Canada since 1996 and we’re happy to keep it that way. Nowadays, the CFL does not need to seek out ways to try to reach the popularity level or moneymaking level of the NFL. Ever since the CFL stopped its expansion into the US, they were reminded again that they can hold their own with loyal Canadian fans. The CFL has the seventh-highest per-game attendance average of 27,000. Its average may be less than that of Major League Baseball and not even half that of the NFL but it has a higher average than the top soccer leagues of Mexico, Italy, Argentina, France and even Brazil. Yeah, that well-attended. 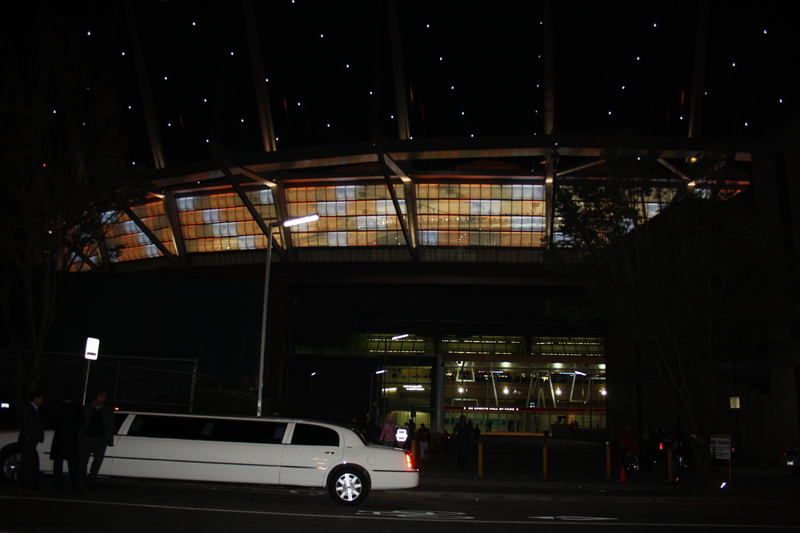 BC Place and its new roof on its opening night. 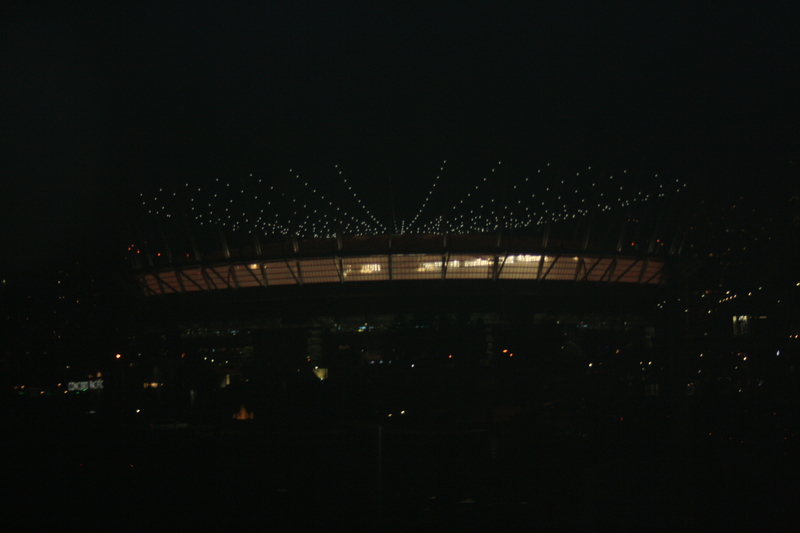 Another pic of the newly renovated BC Place at night. If one would say at the beginning of the CFL season that the Lions would be in the Grey Cup, most would be laughing. The start of the regular season for the Lions was depressing and even frustrating for fans. The first five games were straight losses. Even I attended the fourth game, against Hamilton, and witnessed the loss. Their sixth game was a win against Saskatchewan only to follow it us with a loss against Edmonton. After that, it was like a miracle turnaround. Eight straight wins propelling themselves to the top of the CFL. There was only one loss after the sixth game, and that was against Hamilton in their 16th game in the regular season. By finishing atop the West Division, they only had to wait until the Division Finals to play their first and only playoff game against Edmonton, in which they won 40-23. Overall, the 2011 Lions have had an excellent season with 11 wins and 7 losses. They became the first team in CFL history to lose their first five games only to end regular season on top of the CFL. Many teams they lost to at the start of the season they were able to beat in matches later in the season. The only two teams the Lions did not win against this season were the Hamilton TiCats and the Winnipeg Blue Bombers. This may come as an Achilles heel for the Lions as they will face Winnipeg for the Cup, and Winnipeg beat Hamilton en route to their East division berth for the Cup. However it may not be a glitch as we should remember that the two losses to Winnipeg came in its first seven games of the season. The Lions have sure changes since then and they could be ready for Winnipeg this time. Also a bit of Grey Cup trivia. This year’s Grey Cup may come in the first year of BC Place’s new roof but BC Place hosted the Grey Cup in its opening year: 1983. Like this year, the Lions played in the Cup. Unfortunately they lost. Actually of the three times BC both played in and hosted the Grey Cup, only once were they the Cup winners. Something to think about for Sunday. The Bombers finished atop the East Division with 10 wins and eight losses. Sounds impressive at first but while the Lions started their regular season weak and ended strong, the Bombers started strong and ended weak. They started off impressively winning all but one of their first eight games of regular season. However there was a surprise turnabout as the Bombers would only win three of the last ten games of regular season. They were known for their strong defence but many of their top defencemen were injured later on in the season. By finishing atop the East division, their only playoff game was the division Final against Hamilton which they won 19-3. If their strength from the beginning of the season has returned to form, then they should be able to beat the Lions for the Cup. It may not be 100% as some of their top defencemen are too injured to play in the Grey Cup. If Winnipeg’s defence is still strong, it will be decided in the play for the Cup. One additional note. While Winnipeg had its own challenges on the playing field, its biggest news this season was of the loss of their Assistant Coach Richard Harris. Harris collapsed at the CanadInns Stadium on Tuesday, July 26 and died that afternoon. He was 63. He was promoted to Assistant Coach this season after being their Defensive Line Coach since 2006. This also came as a loss for the Lions too as he was their Defensive Line Coach from 2011 to 2004. Surely Coach Harris will be on the minds of the Bombers when they play the Grey Cup on Sunday. For me, it’s hard for me to pick who will win or who I should cheer for. I was born in Winnipeg and lived there most of my life. However I’ve made a home for myself in Vancouver these past ten years. BC has only won the Cup five times compared to ten for Winnipeg, but Winnipeg hasn’t won the Cup since 1990 while BC’s last won the Cup five years ago. Anyways I decided not to cheer for either team and let the game decide the better team. Anyways, Go Bombers! Go Lions! May the best team win!